Tired of news meteorologists giving you false information about local weather? Learn how to keep track of it on your own – invest in a weather station. Be your own meteorologist with a device which collects weather data using a variety of sensors for wind speed, temperature and much more! If you are like many, the weather outside is very important. So you need the most up-to-date information. Most likely, you watch the local news or go on your smartphone to check. But now you have a better option – your very own personal weather channel! A weather station can be very beneficial for many who depend on weather information as part of their every day lives like farmers, outdoorsy types and many weather enthusiasts. There are many who use the device recreationally and/or professionally. A weather station captures data such as temperature, humidity, barometric pressure and wind speed using sensors. There are also weather stations which can also measure the amount of rainfall or humidity in your area. Other important factors to consider include accuracy, transmission distance, connectivity type and more. Most weather stations have the capability to keep data synced at all times. You can access the weather information on an LCD monitor or on your personal cellphone device by syncing your weather station to your computer or smartphone. The data can be viewed anywhere that you have access to the internet. This can be a major benefit if you’re traveling and want an update on the weather back home. You can use this information to ensure that your house and property are not in any danger due to storms, wind or any other elements in the forecast. Having access to long-term data means that you can make accurate predictions on upcoming weather. You will also be able to trace back over the past year and see what effects the weather had on your home or garden too. Many outdoor enthusiasts like to plan activities in advance heavily rely on a home weather station. A home device can calculate dew point, wind chill and heat index which helps determine the forecast ahead and you can start to make plans accordingly. One example is if you are considering having a barbecue party and want to grill out on the back deck for dinner, you can check your home weather station throughout the day for the most accurate information. It is customized specifically to where you live, so you don’t have to play a guessing game. Too often, people have to make assumptions and possibly cancel events because of potential weather warnings that don’t end up being true for their area. With your very own home weather station, you won’t let the weather stop you from enjoying life outdoors. When you watch the weather channel on TV, the meteorologist focuses on one large area as a whole. This might be an entire county, city or region which might not be giving you the most accurate weather information. By using a weather station, you are able to track the weather in your specific area. The report will solely focus on what is happening around your home. Alerting you immediately of dangerous weather conditions looming. A professional weather station allows you to monitor your weather conditions around your home and backyard or area of business. Its reliable weather monitoring device is built in a self-contained, easy-to-install system. Some may include a sleek but tough outdoor integrated sensor and a comprehensive console which is sold as a whole package. Depending on which weather station model you choose, the setup can take minutes with wireless models or much longer for wired devices which requires more planning. Once the device is set up properly and clear from all outdoor obstructions, some models can provide data within a large range of your specific area of home or business. The information is received by sensors and transmits it to a screen or console which can be updated every few seconds or minutes. The information is consistently updated to provide the most accurate weather conditions happening at the moment. Most models are able to be remotely viewed in real time conditions, historical data and alerts on your phone, tablet, laptop or desktop. Another benefit to owning a home weather station is the ability to help you and your family stay safe. It provides reports even when you do not you have access to TV or online weather sources. If you lose power during a storm, you can still check your home weather station for updates. Most have an optional backup battery that lasts up to 2 years. This is a great way to combat any technical difficulties with TVs, cell phones and computers. The most important thing you can do during a heavy storm is staying indoors and monitor the weather conditions using your personal device. Owning a weather station is the best way to make sure you are alerted immediately with the most accurate information at all times, especially in the case of emergency in your area. A weather station is a durable device designed to collect data about the weather conditions in your local area using multiple sensors. The instrument can be analog technology or digital. The data is then processed within the software which analyzes the information into your computer, phone or tablet. Prior to making a decision on which model to buy, you should consider the kind of information you would like your weather station to collect for your home or business. Depending on your needs, you can purchase a basic or professional weather station. A budget-conscious weather station collects basic data including air pressure, temperature, barometric pressure, and humidity. While a more expensive professional weather station can collect similar data and also wind speed or rain gauge using additional sensors. Depending on the device you choose, the update interval for some devices may be every second, while others may update data every five minutes or so. If you need the most current data collected more frequently, you should consider this factor which varies depending on which weather model you choose. Once you install your own personal weather station, it operates with very little maintenance and it can collect weather data history while keeping you current on what is forecasted ahead. There are 250,000+ weather stations around the world. One very famous network is Weather Underground. The network consists of a world-wide group of weather enthusiasts who enjoy sharing and connecting their data from their weather stations to the online platform. Weather Underground provides a collection of data you need to enhance your ultimate experience on a global community platform and enriching the future of forecasting. When you become a member of this network of weather stations, you contribute your local information with others. This data is then linked to all the sensors globally which create more data for everyone as a whole. The more information that is collected around the world creates a unison of better forecasts linking all sensors analysis when it truly matters. Weather stations and monitor owners of the network enjoy more precise weather conditions for their exact location along with detailed graphs and additional helpful guides about the weather. The network also archives your historical data so you can always look back and share your data while helping to improve weather forecasting for everyone. A win-win for everyone in the network. Join together with other global weather aficionados and become a member of a worldwide weather network. A weather station device is essential in providing the most accurate information for your home or business. It can keep you safe throughout all weather conditions and benefit you by providing the most accurate weather for days ahead too. They are a great investment for many weather enthusiasts and everyday people who like to know more about the weather. 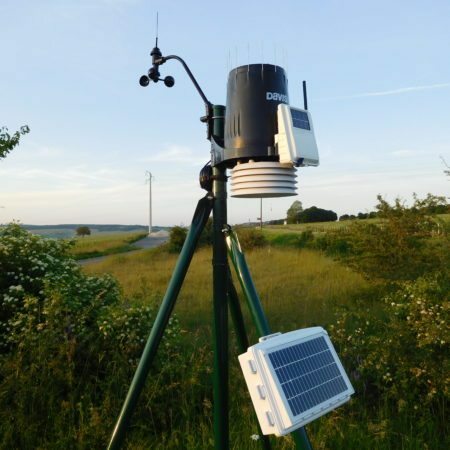 Many people choose to own a weather station because they are also low maintenance while providing long-term data options to evaluate any potential weather patterns ahead. So the next time someone asks you, “how’s the weather?”… you can reply “let me check my weather station!”.